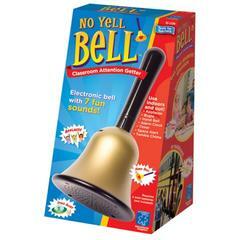 Save your voice while still being able to direct your classroom with the useful No Yell Bell! This helpful teacher tool sounds a chime when shaken, allowing you to get your students attention without wearing out your voice. 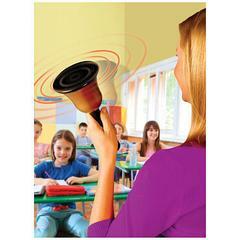 Simple, easy to use, effective, and loud enough for noisy rooms or playgrounds! The perfect tool for teachers wrangling rowdy students, or even parents working with kids at home. Although it looks like a bell, the No Yell Bell actually features an interior speaker with several audio output options. 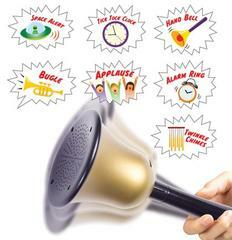 Choose between seven sounds to use-- A standard bell sound, an alarm sounds, a ticking clock, a bugle noise, a space alert, applause, and gentle chimes. This variety allows you to assign different sounds to different classroom activities and situations. 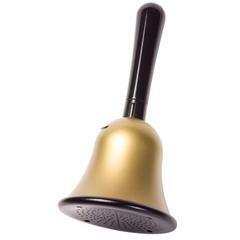 An adjustable volume slider ensures that you can use this bell whether its quiet or loud! There are so many ways to use the No Yell Bell. Not only can it get students attention in high volume situations, it can also be used to start and end activities, give positive reinforcement to correct answers, and more. With durable construction, this item is sure to last for years of use. Requires four AAA batteries, not included.